Join us on Monday, December 1 for a lunch-n-learn meeting at the Lancaster Extension Education Center to hear from Kent Schultz, Director of Marketing, for Central Valley Ag. Kent will discuss the merger between United Farmers Cooperative and Central Valley Ag. He will talk about why they decided to merge and what benefits and opportunities it brings to local growers near their 66 locations in Nebraska and Kansas. Please RSVP in the form below if you can attend. We look forward to seeing you there! 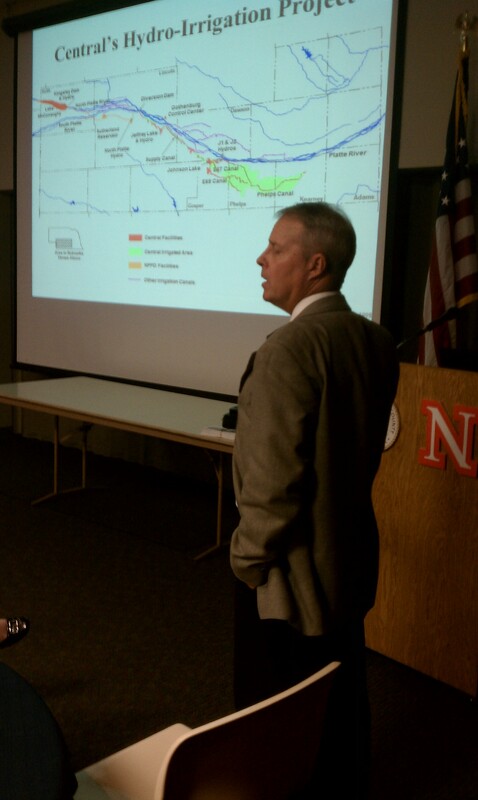 The Nebraska Agribusiness Club met for the October meeting yesterday to hear from Jeff Buettner, Public Relations Coordinator from Central Nebraska Public Power and Irrigation District (CNPPID). Jeff shared about the integrated water management approach they take to the water projects they manage. He didn’t have time to share a video with the club, so we wanted to share it with you on our website. Enjoy! Join us on Monday, October 6 for a lunch-n-learn meeting at the Lancaster Extension Education Center to hear from Jeff Buttner, Public Relations Coordinator from Central Nebraska Public Power and Irrigation District (CNPPID). Jeff will be our guest to talk about the integrated water management approach they take to the water projects they manage. Club members and guests had the great opportunity to hear from John Miller about the history of his fifth generation farm in Murdock, NE at the April Nebraska Agribusiness Club meeting. During this time, hay was the lifeblood from which they grew and nurtured their animals. It was important that every harvest meet the absolute highest standards. Out of that commitment grew the foundation of Oxbow Animal Health. Miller has created an internationally-recognized brand that has become the most trusted name in small animal nutrition, from loyal customers to top veterinarians. Join us May 5 for the Nebraska Agribusiness Club Lunch-n-Learn at the Lancaster Extension Education Center, 444 Cherry Creek Road, Lincoln, NE. Click here for directions. Zoetis (formerly Pfiser Animal Health) discovers, develops, manufactures and commercializes a diverse portfolio of animal health medicines and vaccines designed to meet the real-world needs of veterinarians and the livestock farmers and companion animal owners they support. Mike Morgan the Operational Leader of the Lincoln facility will be our presenter to discuss their change from under the Pfiser umbrella to Zoetis. What new things they have on tap for their Lincoln Plant. He will also bring with him Tom Evans, DVM, and Jack Coogan, EHS Director to help with the presentation and answer any detailed questions about their products. Please RSVP in the form below by Thursday, May 1 at 5:00pm! Join us for the April 7th ‘Lunch-n-Learn’ meeting at the Lancaster Extension Education Center, 444 Cherry Creek Road, Lincoln, NE. Click here for directions. John Miller, Oxbow Animal Health, will share about the history of his fifth generation farm in Murdock, NE. During his time, hay was the lifeblood from which they grew and nurtured their animals. It was important that every harvest meet the absolute highest standards. Out of that commitment grew the foundation of Oxbow Animal Health. Miller has created an internationally-recognized brand that has become the most trusted name in small animal nutrition, from loyal customers to top veterinarians. Please RSVP in the form below by Thursday, April 3rd at 5:00pm! 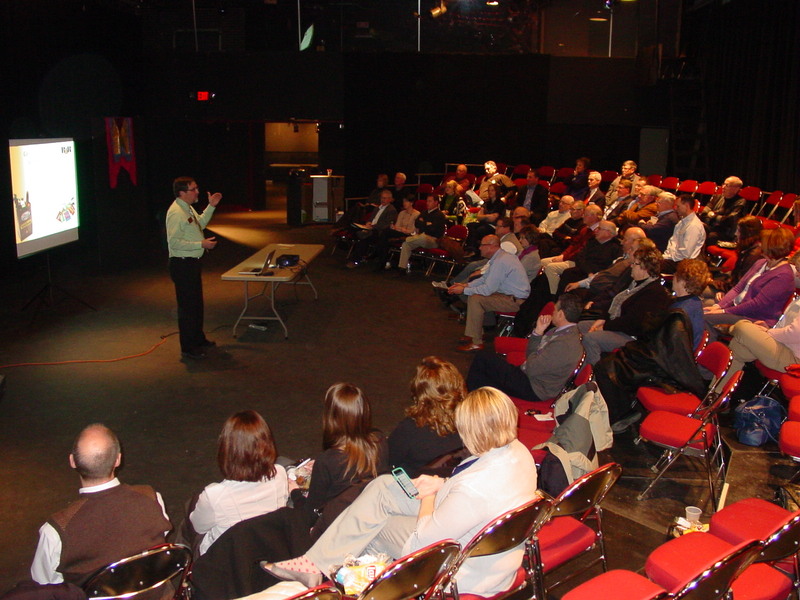 On Monday, March 3, over 50 Nebraska Agribusiness Club members and guests got motivated for the upcoming National Ag Week, March 23-29th by Chris Linville of Three Eagles Communications. Chris shared that the Club will be participating, with B&R Stores, and other partners, week-long, but specifically with B&R Stores to bring agriculture directly to food consumers. 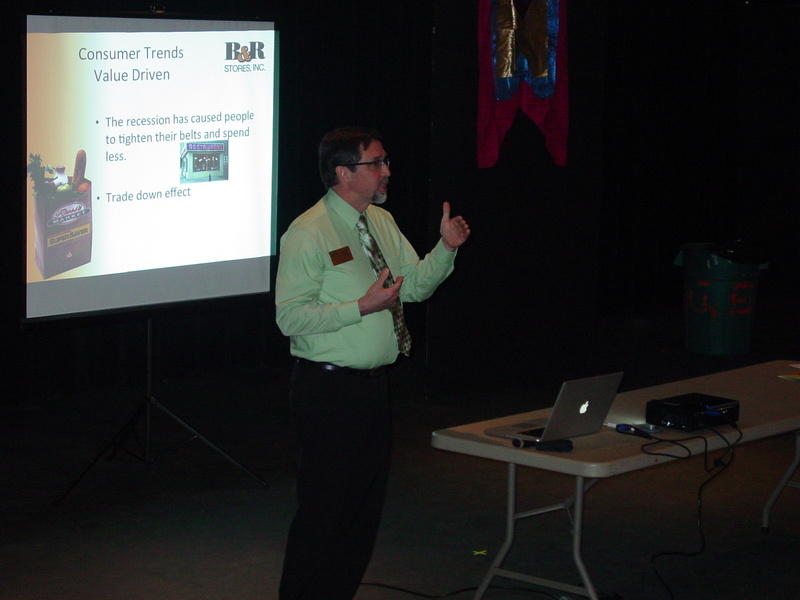 Marty Jarvis, club member with B&R Stores, gave the Club a great presentation on Consumer Trends in the Grocery Store. Come hear from Nebraska Farmers and Ranchers who will share with us details about their operations and answer questions about how they keep up with all the changes in agriculture today at our February meeting. We will take the Nebraska Agribusiness Club on the road to B&R Stores HQ (4554 W St, Lincoln, NE 68503). For a lunch & Learn with Marty Jarvis their Marketing Director to learn about how modern day grocery stores operate, how many products they carry and why that number keeps growing? 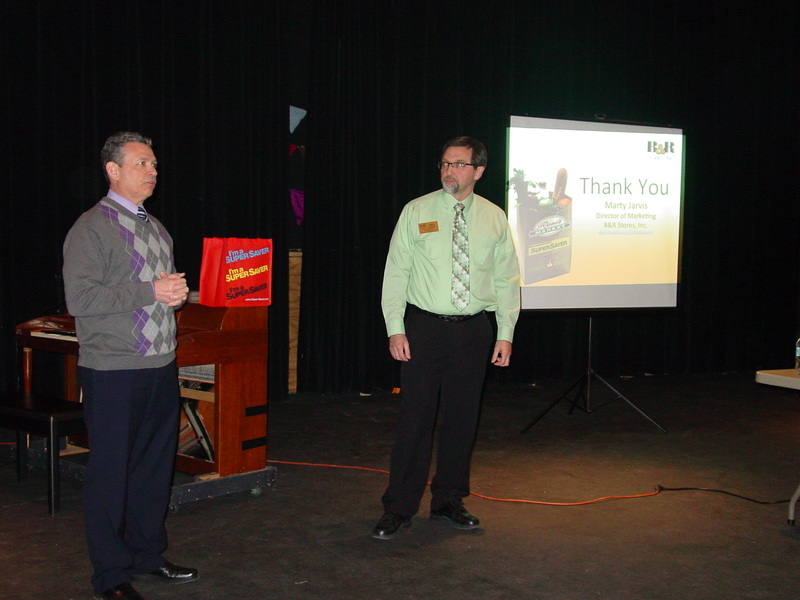 We will also hear about the clubs plans for National Ag Day/Week (March 25th) at their local Russ’s Market stores. Come hear from John Miller about the history of his fifth generation farm in Murdock, NE. During this time, hay was the lifeblood from which they grew and nurtured their animals. It was important that every harvest meet the absolute highest standards. Out of that commitment grew the foundation of Oxbow Animal Health. Miller has created an internationally-recognized brand that has become the most trusted name in small animal nutrition, from loyal customers to top veterinarians. Zoetis (formerly Pfizer Animal Health) discovers, develops, manufactures and commercializes a diverse portfolio of animal health medicines and vaccines designed to meet the real-world needs of veterinarians and the livestock farmers and companion animal owners they support. 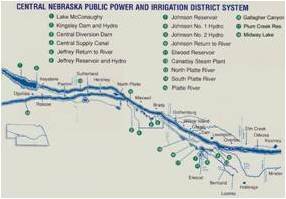 Jeff Buttner, Public Relations Coordinator from Central Nebraska Public Power and Irrigation District (CNPPID) will be our guest to talk about the integrated water management approach they take to the water projects they manage. RSVP for our meetings here! Please join us for the Nebraska Agribusiness Club Meeting on February 3 at the Lancaster County Extension Education Center. Come hear from Nebraska Farmers and Ranchers who will share with us details about their operations and answer questions about how they keep up with all the changes in agriculture today at our February meeting. Lunch will start at 11:30 am with the panel starting at 12:15 pm.